A Wigan man attacked his girlfriend and her mother, as well as wrecking her property. Connor Greenlees, 21, of Severn Drive, Norley, appeared before Wigan magistrates to be sentenced having pleaded guilty to assaulting Judith Loudon and Louise Hendry and causing criminal damage. Shazia Aslan, prosecuting, said Greenlees had been in a “volatile” relationship with Ms Loudon and went to her home, accusing her of cheating on him. He kicked a wardrobe, causing the door to fall off, before kicking the bedroom door and damaging that. She said the police were called, possibly by a neighbour, and Greenlees hid in the attic when they attended. In the second incident, he went to her house while she was in bed with her four-year-old son and joined them. But Miss Aslan said Greenlees became “abusive” and she told him to leave. Instead he had a shower and afterwards called Ms Loudon names and pushed her in the chest. Ms Loudon called her mother and Greenlees left, but later returned and found the pair chatting on the sofa. Miss Aslan said he became “angry and aggressive”, pulling out a kitchen drawer and tipping out its contents. Greenlees pushed Ms Hendry and then Ms Loudon when she tried to stop him, the court heard. Police were called and Greenlees kicked fence panels as he left, damaging them. Mr Marsh said the pair suffered “fairly minor injuries” and did not need hospital treatment. Justices sentenced Greenlees to a 12-month community order, with 130 hours’ unpaid work and 25 rehabilitation activity days. He was ordered to pay £250 compensation to landlady Diane Thompson to cover damage. 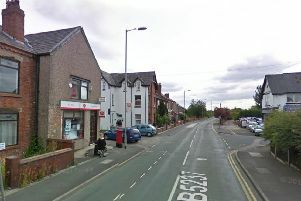 A restraining order was also imposed to ban him from contacting Ms Loudon and Ms Hendry for two years or entering Moor Road, Orrell.